Metro is an option for Caps fans for at least the first three home games of the playoff opening series against the Carolina Hurricanes, without the need for the scramble to find a sponsor for additional hours that dominated discussions during last year’s Stanley Cup run. Game 1 starts at 7:30 p.m. Thursday, so, barring extended overtime periods, fans at Capital One Arena and out watching the game elsewhere should have no problem catching the last trains home. Metro does not plan to extend rail hours Thursday night, the agency told WTOP. Metro now closes at 11:30 p.m. Monday through Thursday. The last trains leave Gallery Place-Chinatown for Huntington at 11:19 p.m., Branch Ave. at 11:28 p.m., Shady Grove at 11:32 p.m., Glenmont at 11:38 p.m. and Greenbelt at 11:48 p.m. The last trains leave Metro Center for New Carrollton at 11:20 p.m., Wiehle-Reston East at 11:21 p.m., Largo Town Center at 11:27 p.m., Franconia-Springfield at 11:28 p.m., and Glenmont, Shady Grove and Vienna at 11:36 p.m. There is limited Red Line single tracking scheduled after 10 p.m. Thursday between Silver Spring and Forest Glen, but trains are still scheduled every 15 minutes before any additional trains are put into service to help with the crowds. There is also some Green Line single tracking between Southern Avenue and Anacostia and Blue Line single tracking between Stadium-Armory and Addison Road. Metro does not expect the work to reduce service below usual late-evening schedules. Many buses through the area are also options for those not interested in paying for parking downtown. 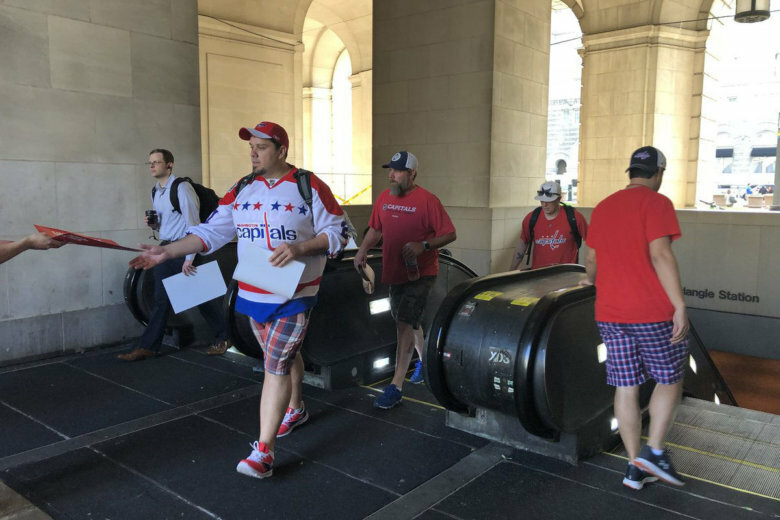 Capitals fans should have an even smoother ride on the rails for Saturday afternoon’s Game 2, since the 3 p.m. puck drop coincides with the final weekend of the Cherry Blossom Festival and limited Metro track work. The festival’s parade, Emancipation Day celebrations, IMF-World Bank meetings, a Nationals home game and other road closures could make driving to the Saturday game difficult though. The Capitals then go to Carolina for games three and four next week, before returning to the District (if necessary) for Game 5 on Saturday, April 20. Since Metro closes at 1 a.m. Friday and Saturday nights, access should not be an issue regardless of when that game starts. If the series goes seven games though, Game 7 would be Wednesday, April 24 back at Capital One Arena. The start time for that game would be determined later if the series gets that far. Last year, after public pleas, the Capitals traded use of the arena with Metro to keep the system open late, the government of Qatar funded extended service once, Uber paid another time, and Pepco parent company Exelon provided the $100,000 minus fares paid during extended service on another occasion. Comcast provided the funding assurance for another game. Many of last year’s home playoff games ended before 11:30 p.m., so the extra service was mostly an insurance policy. Massive crowds used the extra service though when fans gathered downtown to watch on big screens as the Caps clinched the Stanley Cup in Las Vegas, with partying that stretched well into the early hours of the next morning and the parade a few days later.